1) Small Thunder, a new venture in "customized gifts and jewelry for extraordinary events," had its grand opening in Williamsburg this weekend. 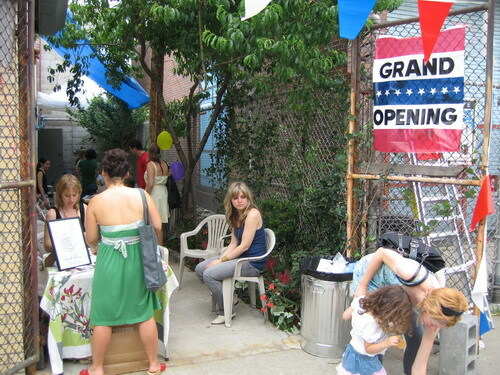 Located on N. 6th Street in a small space just off Bedford Avenue, Small Thunder involves Lisa Levine and Mary Meyer. Judging by the crowd they attracted on Sunday, there is significant interest in their products. Miss Levine has a shop at 536 Metropolitan Avenue, which is between Union Avenue and Lorimer Street. Both designers already have quite the following. 2) That flea market that was supposed to open this weekend on N. 6th Street between Wythe and Kent? It didn't happen. The opening date on the sign on the fence was changed by hand from June 2 to June 12. So, who knows.